Every markets move in cycles. They fluctuate according to time cycles and price cycles. Understanding the driving forces behind the financial markets, you can predict the time to buy and the time to sell. Gann Cycle projects future market reversal dates in terms of divisions of 360 by 2, 3, 4 and 8 as well as their multiples. The cycle includes 30, 45, 60, 90, 120, 135, 180, 270, 360 etc. 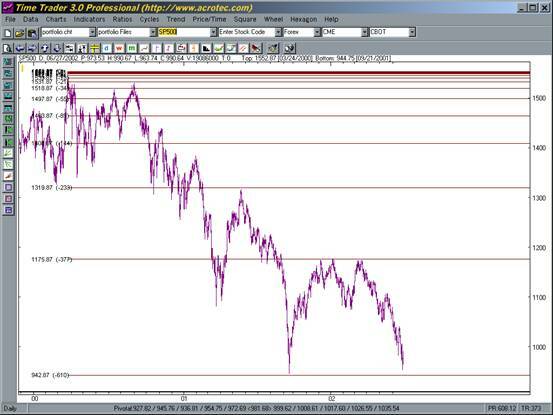 Fibonacci Cycle projects future market reversal dates in terms of fibonacci number series. Fibonacci number refers to 1, 1, 2, 3, 5, 8, 13, 21, 34, 55, 89, 144, 233, 377 and etc. In the series, the Fibonacci number is the sum of earlier two numbers. The series begin with 1 and 1. Lucas Cycle projects future market reversal dates in terms of Lucas number series. Lucas number refers to 1, 3, 4, 7, 11, 18, 29, 47, 76 and etc. In the series, the Lucas number is the sum of earlier two numbers. The series begin with 1 and 3. Spiral Calendar projects future market reversal dates in terms of the square root of Fibonacci number series times the moon cycle (29.52 days). Spiral Calendar number series refer to 15, 20, 28, 38, 52, 71, 96, 130, 175, 234, 313, 418 and etc. The cycle is based on calendar day instead of trading day. Besides, Gann also used square cycle, which includes 1, 4, 9, 16, 25, 36, 49, 64, 81, 100, 121, 144, 169, 196, 225, 256, 289, 324 and etc. To market geometricians, cubic cycle is an important to for long term market project. Cubic cycle includes 1, 8, 27, 64, 125, 216, 343, 512, 729 and etc. Cycle of Seven and Cycle of Nine are also important tools of W.D. 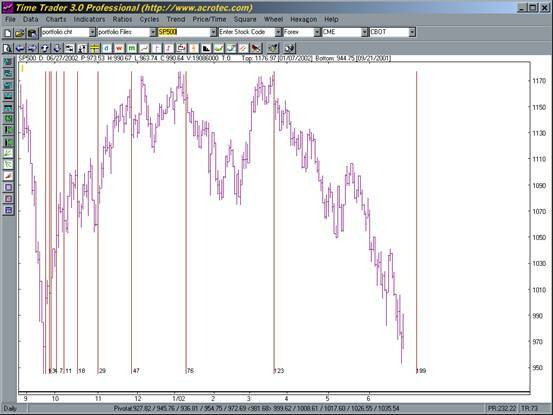 Gann to count market rhythms in terms of multiple of seven and nine.